Long gone are the days when I could just get up and go to the bathroom without a care in the world. Now I either have kids in the bathroom with me, have kids banging down the door to try to get in with me or I’m hurrying as fast as I possibly can in hope that the house isn’t on fire when I come out. There was a time once when I could eat all of my own food. Now every time I sit down to eat there are 4 tiny humans that appear with their mouths open and eat half my food. I have to think twice when I’m going to bed at night to make sure I don’t leave something out that I don’t want the kids getting into in the morning. Dirty plate and knife on coffee table from a midnight snack? Stack of folded laundry on the floor? If I leave it out, they are guaranteed to get into it. Why don’t my kids understand Saturdays are for sleeping in? I think they actually wake up earlier on the weekends. Is it too much to ask that you at least wait until the sun is up? Oh how I miss sleeping in! I used to be able to go from sitting in my living room la-z-boy rocking chair to backing out of my drive way in under 20 seconds. Now that I have kids the 30 steps from the house to the car are more like a wild expedition. Who will run the opposite direction of the car? Who needs to go back into the house for something they forgot? Who needs to stop and count ants along the way? Who wants to just start crying for no reason? Who is going to refuse to put on their seat-belt? Or worse, who is going to insist on putting on their seat-belt without any help and taking 12 times as long? I just want to walk to the car and leave. Is that too much to ask? I actually used to dislike drive-thrus. I’d park and go inside. Drive-thrus made me feel rushed and I just enjoyed the more pleasant close face to face interaction. But now? Forget about it. I’m not schlepping 4 kids in and out of a car if I don’t have to. I’ll drive 20 minutes out of my way to go to a drive-thru. Occasionally I like to just mentally check out, take a little trip in my mind to some far away place where I can ponder deep philosophical questions. Such as: can they combine a knife with a spork? But alas, if I’m not on high mental alert around my kids we are likely going to be taking a trip to the emergency room. It is so mentally taxing to always have to keep track of all of them. Back when it was just my wife and me, we could make a meal and eat it for 3 nights. Now with 4 kids we’re lucky if we make enough. Leftovers don’t exist anymore. I miss leftovers. I can’t go out and do anything on a whim now. It takes days of delicate childcare preparations to be able to leave the house. I used to remember times when I’d sit on my couch and listen to the clock on the wall ticking. Now I can’t even hear myself thinking. I don’t understand how such tiny little humans can make such excessive amounts of noise. Before the kids it was just the two of us all the time. Now we can hardly find time to be one on one. The time after bedtime has become our only real hang-out time. So that’s my list of things I used to take for granted. What are some things you’ve taken for granted? EDIT: Two days after I wrote this post, I realized that I was probably taking some things for granted in my life right now and didn’t even realize it. I didn’t want to look back in a couple years and have to write another “Things I used to take for granted” post. So I vowed to start appreciating certain things in my life. I strongly encourage you to check it out: Why I Appreciate Wiping Bottoms. Yes to the Drive-Threws! All of this is actually a big yes to me, but getting the kid out of the car and then back in takes more time than if I just drive threw. And thank God I have a drive threw Starbucks that just opened a stones throw from my house! Now I can get my coffee and go and that’s probably the only coffee I’ll enjoy all day since the kid is strapped to his seat and can’t heave things at my head because he wants something. Absolutely love the new photo, I know how much prep it takes to pack one around I can only imagine four! My daughter travels like she’s going to Disney World, your diaper bag alone would probably double as a fitness test toting it around. Thanks Gary. It’s actually a really old photo from when we only had 2 kids. Yeah my pack can get big quickly. Some things can be shared (a pack of wipes, a bottle of sunscreen) but other things like lunches or changes of clothes have to be for everyone so it can get crazy depending on how long we plan to be out and about. Thanks man, I enjoyed writing it. It seems to be things that every parent experiences to some degree. Going to play pick up basketball on a whim and other last minute plans are the kind of things I miss being able to do… other than the great list you came up with. No quality time with the wife is definitely a big one for me too. Dad slave! Haha! I feel like I could go on a week long vacation and take less stuff than I need for my kids on a day trip. Oh yeah! The kids have completely ruined my ability to watch SportsCenter! Such great family photos. I must get some done. Every time i see your blog photos it makes me think how much i’d love some of us. Oh no! Please don’t tell me as Ted grows up that i’m no longer going to get left overs?! I love left over pizza for breakfast! ps love the phone showing in your hoodie in your profile pic! A blogger through and through. Yes! The phone, I was rather annoyed it was showing when we got the pics back but you’re the only person who’s ever noticed. Great eye!! I’ll send you a signed and framed copy of the post to hang in your living room. Haha. It’s funny how these things seem to universally happen to all parents. It’s been awhile since I been blogging. Your site is looking great, I like the changes, and as for this post, hilarious! I can totally relate. My oldest is 14 and my youngest is now 20 months. I have forgotten how much work it is to have a toddler in the house, you are spot on with your list, and I couldn’t imagine 4 of them. Thanks Erin. You’re right, in the end the trade off is very much worth it. When you have kids people tell you ‘things will never be the same’ and most of us are like ‘whats the big deal? of course they will be, there is just another one of us now’. But as someone who has two at the other end of the age spectrum (tween/teens) I can tell you it changes as they get older. You get back some of that me time, some of that couple time. But then you lament the loss of ‘family time’…enjoy it while you have it! Great post as always Mike! These days I have too much time on my hands and get to space out and day dream far too much. I have become really good being easily entertained and get odd looks from my husband from time to time. I must say the knife incorporated with a spork has the rocks in my head rolling around now! Bwahahaha! I still miss going to the bathroom alone though because even teens seem to think they need to join you in the bathroom, or it’s the cat or one of the dogs! lol My girls would hang out in the bathroom while I take showers at 15 and 13! If they were still here they’d still be doing it! Hope you are having a great evening! Great post, you’re so right. I didn’t realise going out on a date with the Hubby would take such planning! And now I HAVE to read your wiping bottoms post! So true, spontaneity goes as soon as kids arrive and even going to the toilet requires an audience. 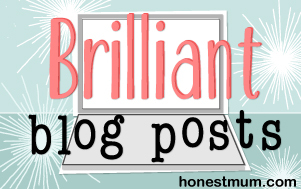 Thanks for linking up to #brilliantblogposts, please add my badge or link back. Thanks. OMG…my husband and I both love this list. It’s all soooo true!!! Bathroom time…non-existent! Getting in the car in less than five minutes…completely impossible! When we moved to Sarasota, I spent three weeks looking for a drive through dry cleaner. I told my hubby that if I didn’t find one, he was going to be responsible for his own shirts! I’m just thankful that my youngest is finally old enough that I can put on a cartoon and go back to bed on the weekends!